One of the most courageous confrontations in the world’s history of nationalist wars and liberation movements took place on April 8, 2011, in Ashraf, Iraq, the seat of the Iranian opposition movement at the time. Spearheaded by 1,000 Iranian heroines, the PMOI freedom fighters stood up to a column of ten armored, infantry, mechanized brigades and battalions of the Iraqi forces who attacked Ashraf City at the behest of the Iranian regime to massacre all of its defenseless residents, destroy the city and annihilate the opposition. The freedom fighters, women and men, young and old, were empty handed without any shields. Their heads and hearts were targeted by snipers. At least 22 people were ran over by armored vehicles. Residential units were shelled. Iraqi troops did not allow the wounded to be taken to hospital. The shooting of heavy armored vehicles and snipers continued incessantly for six hours. The plan was to massacre all the residents of Ashraf. 180 people were shot directly. A number of hostages died in captivity. Some 300 people were wounded. In the history of nationalist and revolutionary wars, there never was an instance where people stood, empty-handed without any shields, in front of armored vehicles and armed forces of the enemy and yet succeed to repel them. The attack was another link in the long chain of terrorist schemes, blockades, and massacres of the Iranian opposition members carried out by Tehran’s puppet in Iraq, Prime Minister Nouri al-Maliki. But Ashraf residents stood firm and resolved to prevent the enemy from taking over the city which was the beating heart of the Iranian people’s Resistance movement. On that day, eight Iranian heroines and 28 heroes were killed either by the Iraqi Army snipers or were ran over by armored vehicles. Hundreds more were seriously wounded, some by grenades thrown to explode among them. The price was horrendous but these Iranian heroines and heroes managed to stop the enemy’s advancement and save Ashraf, the Iranian people’s bastion of freedom. They proved that they can overcome any force by their amazing unity and steadfastness and by paying the dear price. This was not only a military confrontation, but a staunch defense of the most sacred humane values inspiring people to fight for freedom and equality. In this epic picture, there were eight Iranian heroines who fought and died at the forefront of the confrontations but foiled a major conspiracy by the mullahs by their sacrifice and courage. These women symbolized the resolve and sincerity of a generation of women, 1,000 Iranian heroines who pioneer and lead the Iranian Resistance movement and comprise an unprecedented asset to the Iranian people’s 150-year history of struggle for freedom, an amazing force for change. If and when they overcome the misogynous Godfathers of fundamentalism and terrorism in Tehran, not only will they change the situation in Iran but will have a great impact on the war-torn Middle East and the petrified Europe. Saba Haftbaradaran was born in a Tehran prison in 1982. Her father and mother had been imprisoned for their opposition to the mullahs’ regime. Saba was 1.5 years old when she came out with her mother’s release. After both her parents were released from prison, they left the country and joined the Iranian Resistance in the border region. She grew up in Ashraf and was sent abroad to Germany when the Gulf war began in 1990 and children were in danger of being killed in the massive bombardments of Iraq. Saba, however, did not forget the suffering of her people. She said, “I cannot enjoy having the best life and education in Germany, when I hear every day shocking news of women and children suffering in my homeland.” So, she left Germany and went back to Ashraf in 1998. With the beginning of another war in Iraq in 2003, another testing time began for Saba and for all the young women and men like her who were being exposed to the difficulties of struggle against the mullahs’ regime in a strange land. Of course, this generation remained steadfast in the stormy events of the post-war Iraq and under attacks of the Iraqi agents of the Iranian regime. Saba was 29 when she was shot in the thigh and started bleeding heavily. Iraqi forces impeded her treatment by delaying her transfer to hospital. Nevertheless, they did not allow Saba to receive blood from the blood bank, a measure that led to her eventual loss of life. And with those words and her courageous endurance, she turned into the symbol of the epic resistance on April 8, 2011, in Ashraf. Shahnaz Pahlavani is another of the Iranian heroines slain on April 8, 2011. She was born in 1961 in Ramhormouz, in southern Iran. She grew up and studied in Isfahan in an orthodox Muslim family, but did not like the practices of her family. After the 1979 revolution in Iran, she found her ideals in the opposition, but she lost her contact with the PMOI after it was declared banned in the country and the PMOI supporters and sympathizers were mass executed and massacred by the regime. After 2003, she found out that she can travel to Iraq and join the movement, which was the happiest moment of her life. Shahnaz was very grateful for finding the movement after years of separation and she was willing to sacrifice anything for the good of others and advancement of the goals and objectives of the Resistance in Ashraf. On April 8, 2011, when Ashraf was under attack, she volunteered to join the front-line of men and women who defended the city and was slain in the direct shootings on defenseless Ashraf residents. Mahdiyeh Madadzadeh was 29 when she joined the Resistance movement in Asrhaf. She had received her Bachelors of Science in Computer Software. She was very dissatisfied with the situation and the ruling regime in Iran and she found the answer in the Resistance movement that was based in Ashraf. After going through much difficulties, she overcame all the obstacles and joined the movement along with her sisters and brothers. Mahdiyeh was 32 when she was directly shot by a sniper. Her brother, Akbar, was also ran over by an armored vehicle on April 8, 2011. Asiyeh Rakhshani‘s parents, both PMOI activists, had to leave Iran to join the Resistance. So, she never saw the homeland she loved so much. Her ancestors were from Sistan and Baluchestan, and she loved her native land dearly and followed up on their news. She joined the Resistance in 1999 and she was very devoted to the cause. She was prepared to sacrifice from her own for the well-being of others. She believed that the fate of her people in Iran is tied to the efforts and resolve of the pioneers in Ashraf, including herself. Most recently, she was into film production and helped document the events in Ashraf. So, on April 8, 2011, she was also filming the scenes of savagery and brutality of the Iraqi forces, targeting and shooting the human chain of her friends and comrades who were defending their city with their flesh and bone. Finally, she became a target for the snipers at the age of 28. Faezeh Rajabi was only 20 when she was shot in the neck by snipers after she rushed to the front human chain to defend Ashraf. Faezeh’s father was a political prisoner of the clerical regime who was killed under vicious torture in 2008 after seven years in prison. Faezeh went to Ashraf and joined the Resistance after her father was slain. Nastaran Azimi was born in 1985 in Tehran. She was a second-year student of Computer Sciences at Tehran’s Poly Technique University (Amir Kabir) when she was arrested and imprisoned for her anti-government student activities. Prison strengthened her resolve to continue her struggle against the regime. In 2006, she found out about the existence of this hub of resistance against the regime. A subsequent visit to Ashraf completely changed her life. Upon return to Iran, she was arrested and imprisoned, again. After coming out on bail, she started arranging for another trip to Ashraf, this time for good. In Ashraf, she was always in the first line of people defending Ashraf during attacks. So was the case on April 8, 2011, where she was targeted by sharp shooters and lost her prolific life at the age of 26. Marzieh Pournaghi was 48 when she lost her life in the April 8 attack. She knew the PMOI since she was a high school student in Iran. She was arrested and imprisoned in 1983 when she was 18 for supporting the PMOI. She spent three years in prison and lost her contact with the movement. She received Bachelors of Science in Social Sciences Research. In 2007, she found out about Ashraf and traveled there for a visit. Upon return to Iran, she was arrested and imprisoned but later released on heavy bail. Then, she quickly left the country with her husband and son in June 2008 to join the movement in Ashraf. Marzieh was very popular for being very kind and humble, at the same time determined. Her son was 16 when he lost his mother. Fatemeh Massih was born in 1956 in the central Iranian city of Yazd. Her family were religious but at the same time very much against oppression of the mullahs. Her sister was killed by the clerical regime in the early 1980s along with her husband and five of their children and son-in-law. So, Fatemeh had felt the regime’s oppression with her flesh and bone. 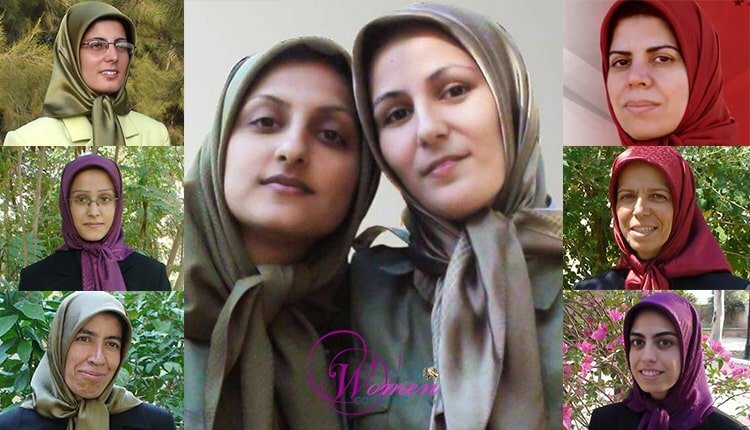 Fatemeh used to say that it was her dream to find the PMOI and join them so that she could struggle for the freedom of her country from the mullahs’ clutches. She loved her sisters in Ashraf and she worked hard day and night without letting anyone find out about her efforts. She did not expect anything for herself. On April 8, 2011, she was also one of those who had rushed to the front line to defend Ashraf and help their wounded sisters and brothers. With their sacrifices, these heroines saved Ashraf and impacted subsequent developments which opened the way towards Iran’s freedom. They will be always remembered as heroines who hoisted the flag of freedom in the darkest days of their country’s history.